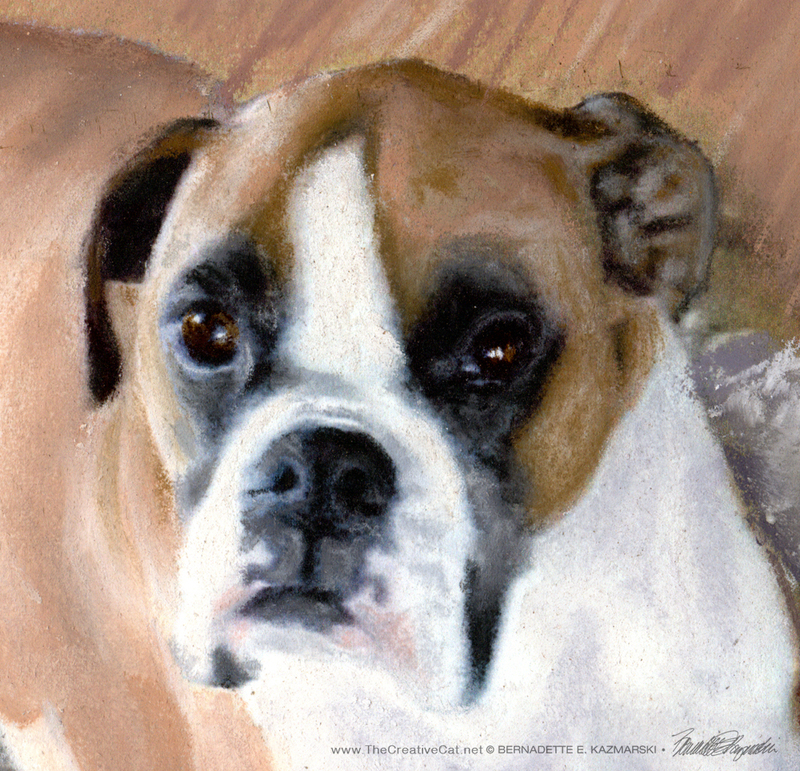 Meet Annie, a boxer mix whose portrait I recently finished. 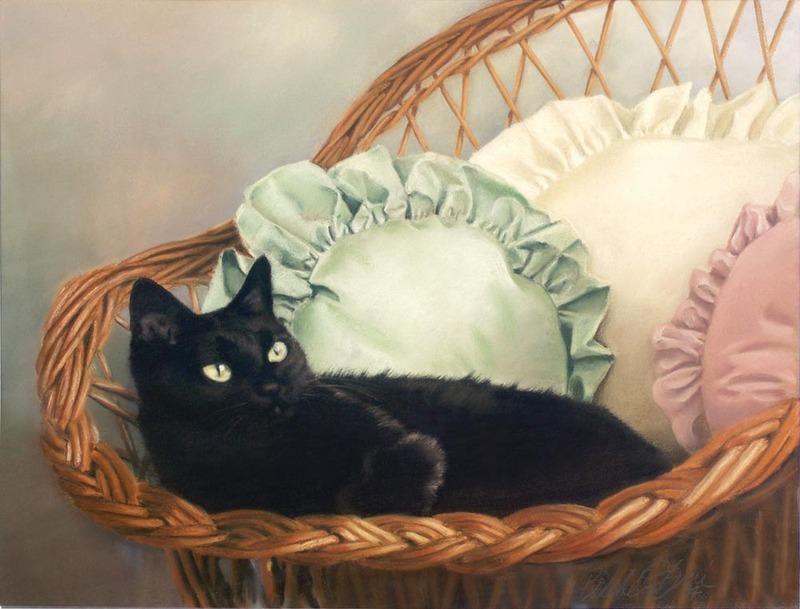 Her person won a portrait certificate I donated to Advocates 4 Animals in Xenia, Ohio, so though I only met Annie through photos and emails she looks so beguiling there on her rug and was a joy to paint I feel like I know her. Annie’s portrait was fairly straightforward, and this was the reference photo her person chose as the pose she’d like for Annie. Reference photo for Annie’s portrait. 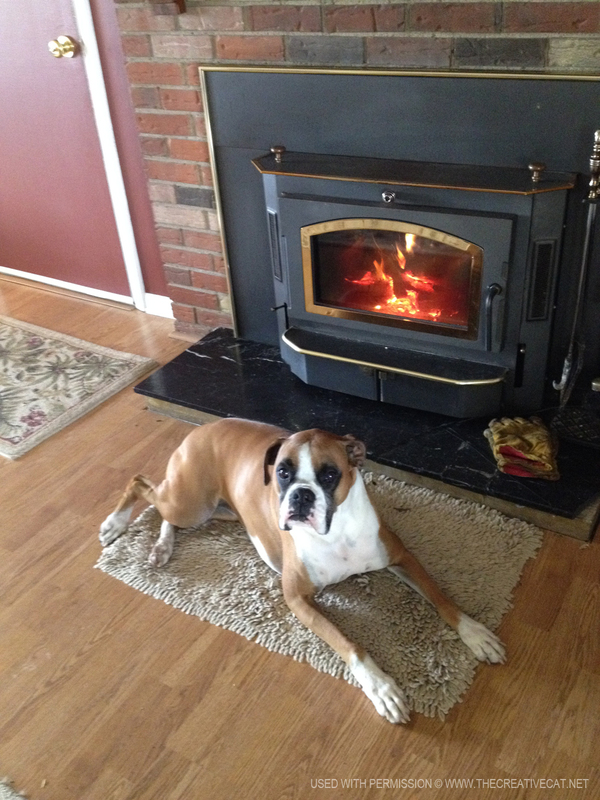 A happy dog in front of a fireplace, what a wonderful pose! Her posture is perfectly composed—animals really do know how to pose—though the lighting is a little contrasty, often an issue with digital cameras. It’s a funny thing with digital photos too, they look great but often when you need clarity in details it just isn’t there. 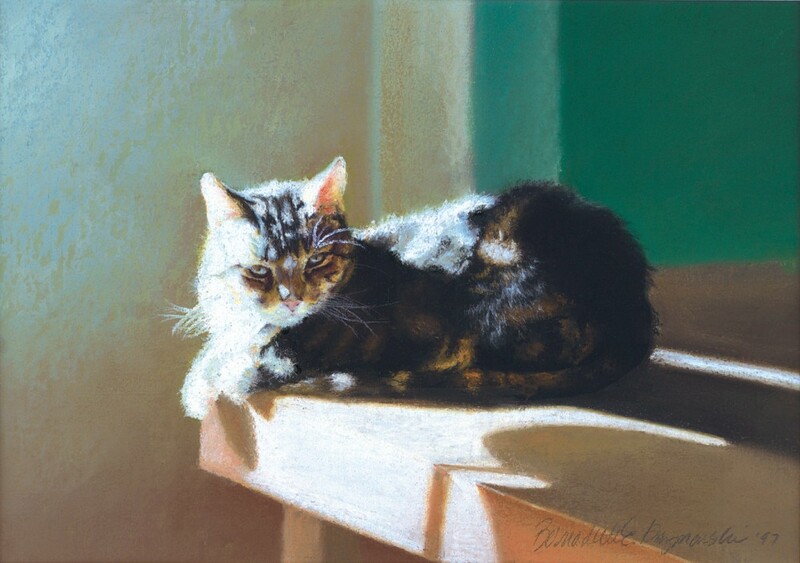 With the contrast in the photo the brightest highlights are washed out on her paws and the deepest shadows around her eyes and nose were filled in. I asked for a few closeups of her face just so I could see the structure in detail, even if they weren’t in the same angle or lighting as the reference photo. But that makes all the difference in creating an accurate portrait. And then too, because the portrait was to be 11″ x 14″ maximum, I decided to leave the fireplace out and just simplify the composition to focus on Annie. With a larger portrait I would have been happy to include it, and Annie would still have been large enough to see in detail, but smaller portraits don’t hold up well when you try to include too much of a background. I did enjoy the wood and the rug as well. Painting patterns is fun because I get to study the object, the wood grain and the cotton chenille, and decide how to recognizably render it without drawing every last thread and wood fiber. I straightened out the parallax in the wood grain, where it changes angle across the image, because it would have been oddly noticeable in a smaller image—many things work fine in a photo, but not in a painting. I also straightened the slight foreshortening of Annie and the rug that happened from the angle of the photo, where her hindquarters look proportionally smaller than her chest and head and front paws. And Annie’s simple little portrait is actually compositionally complex. 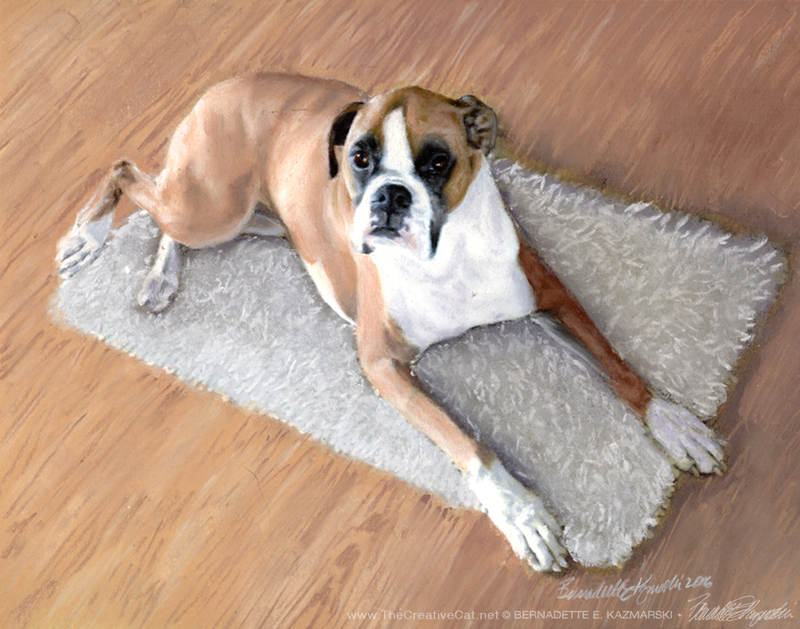 The wood grain is on an angle in one direction and Annie on the rug crosses the wood grain, which balances everything just perfectly. Everything lined up with the edges of a painting can be classic or it can seem static and dull, and having subjects angled within a composition can be dynamic or a disaster. Both compositions have their benefits and challenges. I like how Annie’s portrait is simple but exciting to look at. Because these portraits are typically smaller and simpler, they don’t have the story attached to some of my larger and more elaborate portraits, but they are special to their person and to me nonetheless—no one pays a good sum of money for a portrait of their pet, whether they bid on it at an auction or purchase directly from me, without a lot of deep feeling involved. 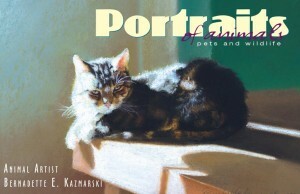 Visit my website to see portraits of my cats, commissioned cats, commissioned dogs, people or just browse a gallery of images and a demonstration of how I put a portrait together from photos. “Certificate A” and “Certificate B” look the same, but this is for ease of ordering. I will write the amount on the certificate.